On the surface, it’s pretty obvious what Sagittarius’ glyph represents - an arrow. But upon closer inspection, the arrow has a heftier portent. The arrow is symbolic of aim, and there’s nothing quite like Sagittarius’ who has clear aim to a dream or goal. Furthermore, the arrow is a symbol of being direct, or hitting the mark in effort and meaning. Sagittarius tends to do this in spades. Renowned for their bluntness and candor, Sag has no problem with hitting the bulls eye of truth. More mature Sagittarius’ have learned to launch their arrows of truth in diplomatic ways. 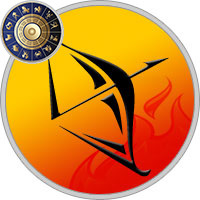 Less tactful Sagittarius can land their arrows of honesty in painful ways. In a more tangible sense, this zodiac symbol of Sagittarius represents high-reaching ideals. The arrow of this glyph always points upwards. This is symbolic of being grounded (as an archer may be on the ground) while aiming high, and launching ideas (the arrow) into the ethers of the unknown...unsure where that ideal/arrow will land, but willing to let loose of the bow and see what happens. This is a quintessential Sagittarian attitude. Fire: Aries and Leo also share the element of fire in the zodiac, and they express their fire in undeniably passionate ways. Sagittarius takes fire to a unique level. How so? Well, fire is symbolic of many things, like: Passion, heat, provision, inspiration. Sagittarius possesses all of these qualities. But there’s another essence to fire that is akin to Sagittarius’ disposition. That essence is wanderlust. Think on it. Let a fire go unbridled, and it will run wild. Ever see a tiny spark grow into an unbelievable fire? That’s a Sagittarian potential. Left unchecked, a Sag fire will blaze a trail that can be both stunning in its beauty, and horrifying in its destruction. Sagittarius has a spectacular ability to create brilliance and also destruction at the same time. It’s a good thing to know when contemplating this sun-sign. The light and heat that comes from fire is a very, very good thing. It can also be dangerous to mess with. Narcissus: Those of you who know the mythology behind Narcissus, might know that the Greek hunter was besotted with his own appearance. He couldn’t pass a reflection without admiring himself. That myth isn’t too dissimilar from Sagittarius’ perspective. Healthy Sagittarians love themselves, and figure everything is all about them. Narcissus the flower, also shares the same self-loving bent. How so? Well, Narcissus is a perennial. It comes back, over and over every year... reminding us of their beauty, and how lovely they look upon the land. Narcissus the plant is also very "vocal" in about their looks. To explain, this flower is a relative of the daffodil family. As such, most Narcissus have a trumpet-like flower. This is symbolic of trumpeting their own loveliness...something many Sagittarius have no problem doing either. Turquoise: Turquoise the stone comes in many different colors, but blue is most potent for Sagittarius. Blue turquoise will have a tendency to calm a wild Sag, and get them grounded to the point of being able to think their actions through clearly. As a grounding stone, turquoise is a perfect stone for Sagittarians to wear because it helps to put feet (and arrows) back in the ground before they fly off to parts unknown (or unwanted). Indeed, turquoise will enhance clarity of thought and emotion - which comes in handy for many Sagittarians. Turquoise is also an absorbent. Meaning, it will absorb a lot of negative influences unique to a Sagittarius. Centaur: Chiron is the famed centaur of Greek mythology because of his endless search for truth and logic. What’s less known about Chiron the centaur, is his relentless struggle between civilized thought and his primal nature. Herein lies the juxtaposition of Sagittarius symbol and nature. 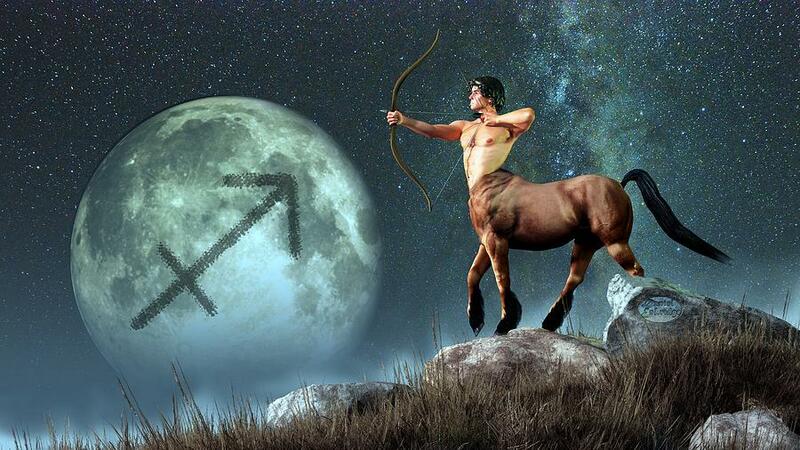 The centaur and Sagittarius share a wealth of commonalities. At their core, Sagittarians are teachers. They love to explore (in mind, spirit, emotion, in the world, wherever) and then bring back their discovers to share and teach the world. But they struggle in their adventures with their wild nature. That’s where the horse comes in. Undomesticated horses are known to be rambunctious, roam, sow wild oats, etc. That’s a struggle for Sag’s too. Another interesting similarity between centaurs and their Sagittarian counterparts is the aspect of duality. On the one hand, we have an unbridled, untamed beast - the horse - whose only compass is scent, sight and senses. On the other, we have human who has a broad buffet of emotion, intellect and intuition to pick from. Half man, half horse is a duplicitous place to be in, and that’s a constant tug-of-war for a Sagittarius to deal with.